Fishtail Braids : Everything About Fashion Today! Girls all over the world love to adopt different types of hairstyles. Hair color, hair cuts, hair updos and braids etc are loved by all. 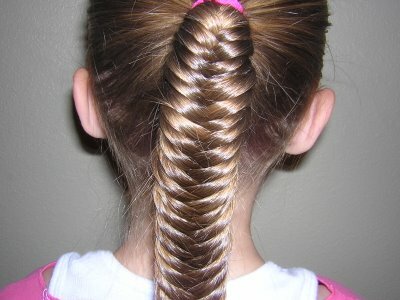 Fishtail braid is also a very famous hairstyle. It is also known as the Herringbone or Fishbone. It drastically elaborates your looks plus it is less time-consuming too. Here is how you can do a fishtail braid/fishtail plait in just 5 minutes. Start with a slightly damp hair. Tie your hair in a small ponytail and divide it into two sections. Pull a skinny strand of hair from the outside of the left section, and add it to the right side. Pull it tight. You have to repeat the same step to the right side. Pull a skinny strand of hair out from the outside of the right section, and add it to the left side. Pull it tight. Keep on repeating the same till your braid reaches the desired length. Tie an elastic band or hair-tie at the end to secure your fishtail braid. You have to keep in mind that the skinnier the strand you use, the more intricate the braid will look. In general, to get and even look, try to use the same thickness throughout your braid. To make sure there are no flyways, use bobby pins. If you need some visual help, check out this video. Have fun! !